We’re feeling all festive at JAM towers, thanks to our super turbo pink Christmas tree. Apparently team JAM is not alone in celebrating the festivities today. Word on the street is that half of Manchester’s finest PR, marketing, digital and media types are hitting the town tonight, letting their hair down after a jam-packed year of fantastic work and sterling results. Chardonnay at the ready! T’is the season to be squiffy! 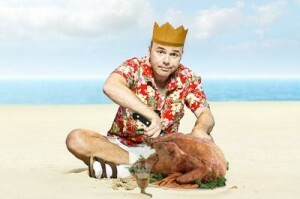 An ‘idiot abroad’, Karl Pilkington has beaten typical ‘hard men’ Daniel Craig, Jason Statham and Bear Grylls to be named the person Brits would most like to be with, if the world was ending. With the Mayan calendar predicting the world will end on 21.12.12, my Travel Cash, the prepaid currency MasterCard®, conducted a survey to find out where in the world people would most like to be on doomsday, and which celebrity they’d most like to be with (granted their nearest and dearest were already with them). With the majority of Brits choosing to flee Blighty, 24% of respondents wished to spend their last moments in the lap of luxury at sumptuous celeb haunt, the Maldives. The City of Sin, Las Vegas, and family favorite Disney World, Florida took joint second and third spot, splitting the nation as to whether to blow their life’s savings at the roulette table, or enjoy a day of thrills on the rollercoasters with the kids. Karl Pilkington only just beat Stephen Fry as the number one celeb, suggesting that as a nation we were divided over whether we wanted the last conversation we had to be intellectually stimulating – or just to finish up on a good old laugh. Other respondents were clearly more concerned with aesthetics, with beauty Mila Kunis and heartthrob Ryan Gosling sharing third place. Tulisa may have been named 2012’s sexiest woman in the world, but she failed to even rank. Despite choosing to see in the end of the world in an exotic location, 13% of respondents opted for a traditional homely Christmas dinner with all the trimmings as their last supper. However for a tenth of respondents, a greasy Chinese takeaway proved too much to resist, as did a spicy curry, indicating we all need a bit of comfort in an hour of need. In the throws of such a crisis it seems we turn to last chance saloon of all the things we possibly should have done in life but stereotypes prevented us. Surprisingly, romantic Venice came in second place for male respondents and tellingly, it was the females who opted for Sin City. Talk about role reversal! Pulling back the manliness, men typically wanted to devour a full English and in close contest to Hollywood starlet Mila Kunis, they’d most like to spend their last moments with Olympian heroine, Jess Ennis.